Many people will probably, on hearing the name John Holder, remember initially a well-respected international umpire but it is easy to forget that he had a decent, six-year playing career with Hampshire. Born in Barbados, John Holder was one of a formidable posse of fast bowlers emanating from that island. Andrew Murtagh is making a reputation of writing very nice and enjoyable books about his former team mates after his previous venture with Barry Richards. 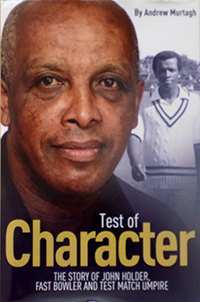 Test of Character follows a similar pattern to the Barry Richards book, Sundial in the Shade, with the author interviewing his subject with the end result an entertaining and engaging story of the player. Test of Character shows John Holder to be an easy-going, polite and affable chap. Modest also despite, I suspect, some mischief from the author in order to try and elicit, at times, a more dramatic remark or two! I suspect that Andrew Murtagh, who became a teacher after his Hampshire career, has a knack of asking slightly, at times, awkward questions if the occasional responses from both players are anything to go by. “ Look, Murt,...” It is also abundantly clear that he was very proud to have played with both Holder and Richards and that he has now put the story of these two cricketers to paper is to the benefit of many. Test of Character is a long book but the reminiscences of both Holder and Murtagh are tremendous fun to read. Events from their playing days to the current days show probably how much more fun was had whilst they were both playing. John, though, is a fair and thorough gentleman throughout despite Andrew Murtagh’s occasional persuasion and cajoling. Many readers should enjoy the stories of county cricket in the 1970s. John Holder's umpiring career came to an almost premature end when he was not re-engaged on the International panel following his reporting of ball tampering by the England team. Even for a mild-mannered and easy-going person, this was a galling episode which led to a ten-year hiatus from the game but did eventually lead to a surprise recall. It lasted one Test and, like the previous experience, there appears to have been a distinct lack of communication. The reader may well pick up on John's dissatisfaction and upset. John Holder’s story from his birth in the small village of Superlative to working on the London Underground and through his playing career to respected umpire is all engagingly chronicled in Test of Character. At Wormsley recently for a Barbados-themed day, John Holder, now in his early 70s, was still looking as dapper as ever and I would urge any interested readers to buy this worthy book. I would also urge Andrew Murtagh to press on with his good and great county colleagues and keep coming out with the books.